Running High Sierra (APFS, unencrypted) with up-to-date Boot Camp Assistant (6.1.0) — clean OS install a couple days ago. Running into trouble at every step of the process, with both Windows 10 64-bit and Windows 8.1 64-bit (clean ISOs downloaded directly from Microsoft). Use Boot Camp Assistant to create partition (122GB on 1TB SSD). It downloads Windows Support files, but 9 times out of 10 the laptop crashes at the step of “Saving Windows Support files” – but force restarting allows me to alt/option-boot into the Windows installer anyway: great. Boot into Windows 10 installer, format Boot Camp partition, select Windows version (have tried both Pro and Home) — it gets through copying, expanding, installing Windows files… but then I get an error every time at "Installing Updates” – error code 0x80070002, can't find drivers compatible with this hardware — Windows will restart (doesn't restart, just goes to a black backlit screen and stays there until I force restart). Ok. Delete the partition, download the Windows Support Drivers to a FAT-formatted USB drive, then repeat all the above. Same exact thing. Ok. Delete, repeat, but once booted into the Windows installer, first click "Load drivers" and select the OSXRESERVED partition: shows up all the driver folders, but shows no actual driver files when you navigate to any of the folders. Un-check "Hide drivers that aren't compatible with this hardware”, and a few drivers show up for each piece of hardware — install them all. Proceed to Windows install – no dice, same error at “Installing updates” stage. Ok. Delete, repeat, “Load drivers” but check the USB instead of OSXRESERVED — same thing, folders are there but drivers don't show up unless I un-check the ‘Hide non-compatible drivers’ option. Ok. Try again with Windows 8.1 instead of Windows 10, and older version of the support software (Boot Camp Support 5.1.5722) on the USB. This time Boot Camp Assistant actually completes the “Saving support files” portion of the automatic driver download, and asks for admin password for restart, instead of crashing. Great. Boot into Windows 8.1 installer – it requires a license key instead of having the “I don't have a license key” option, but find one online to get me to the next step. This time it hangs indefinitely at 24% of copying Windows files. Anyone have any advice? Am I missing something obvious here? Below are the instructions for installing Windows 10. Remove all Windows related partitions that may have been created by previous attempts to install Windows. When finished, the output from the command diskutil list disk0 should appear similar to what is shown below. I assume your sizes will be slightly different. The command below will create the 122 GB "BOOTCAMP" partition on your internal drive. The space occupied by this partition will be used for installing Windows. Note: Since I do not know the exact size of your Apple_APFS partition, I assumed the partition was 999.8 GB in size. Since this is unlikely, you may have to adjust the value of 877.8 GB. 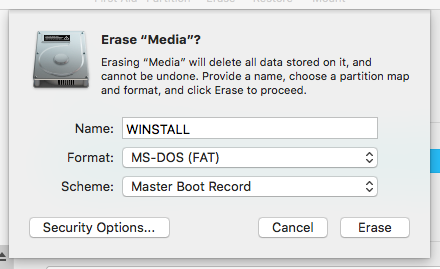 Use the Disk Utility application to erase a 16 GB or larger USB flash drive. Enter the settings shown below in the popup window. When finished, do not remove the flash drive. Note: You can not download the Boot Camp Support Software for your Mac computer from any Apple website. You must use the Boot Camp Assistant to download an officially copy of this software. Mount the Windows iso file and copy the contents to the "WINSTALL" volume. You will need the use the cp command from a Terminal application window. Below is the exact command I usually use. The string ESD-ISO is the name of the mounted ISO file from Microsoft. If necessary, make the appropriate modifications. Continue starting at step 3 of my answer to the question Boot Camp Assistance is stuck on create a partition? Not the answer you're looking for? Browse other questions tagged macbook bootcamp windows driver dual-boot .